It seems that every year when January and February roll around I get this need to do a project. Last year it was the girls’ new, shared bedroom. Out with the crib and whole nursery scene and in with the “big girl stuff,” as my girls like to say. This year when January rolled around I again got this yearning for some sort of crafty undertaking. I happened to be on a blog that I love and follow regularly, SouleMama.com, and she had some pictures of the most adorable little flannel night gowns and I knew that I had found my project. In her post she mentioned that she used a Butterick B4910 pattern for the gowns and I began to get a little nervous. Now you see, I had never actually used a pattern in my entire life. My sewing skills up until this point consisted of items like one-seam sun dresses, pillow case dresses, quilts, and fabric napkins. So you can image my surprise when I carefully opened the Butterick package to find those lovely brown pieces of tissue paper with print all over them. Oh my. Talk about a flood of anxiety! But after some work, I realized that I truly LOVED this whole sewing thing. And then I became obsessed. I made 6 nightgowns (some for my girls, some for a birthday present, some just to make for when I come across anyone who may want one). 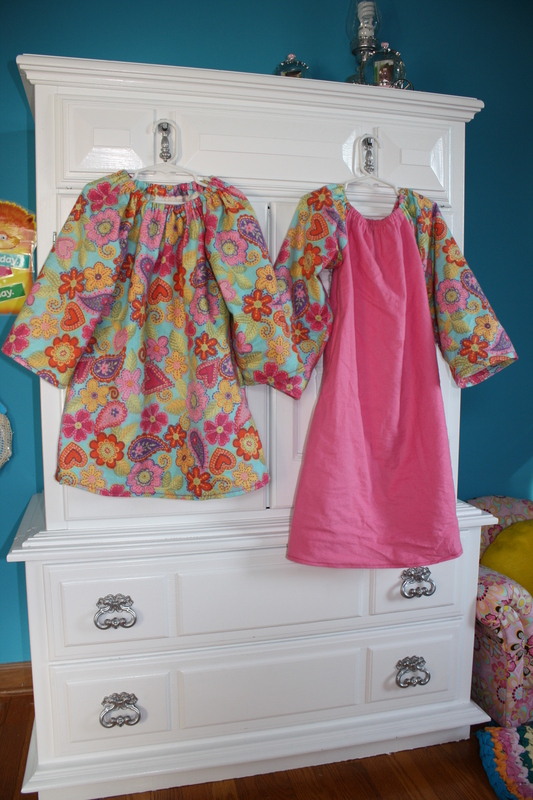 Here are two of the gowns I made for my girls for their Valentine’s Day present. Then I thought to myself, “My goodness, if I can make this gown, why not try the shirt and pants that are in the pattern as well?” So on I went with my sewing, a little bit each day, and my how I have realized this is an amazing way to relax and unwind at the end of a crazy day. 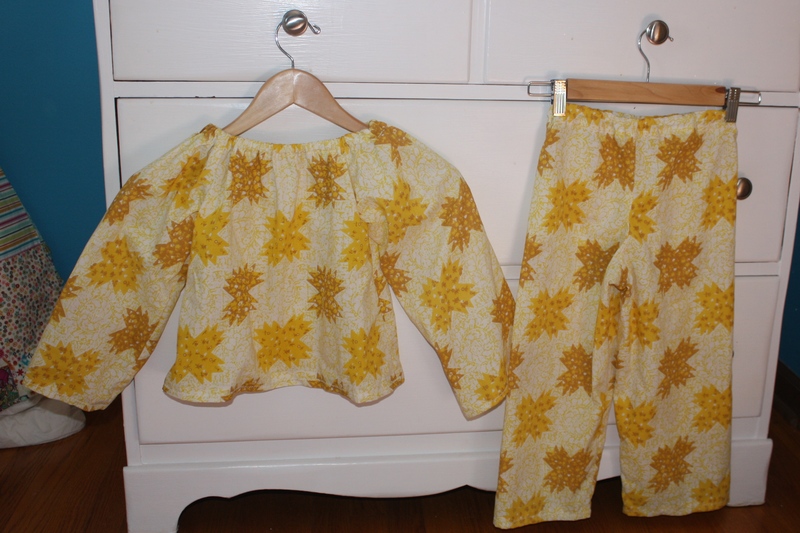 Here are some of the PJs I made out of some vintage cotton curtains I thrifted. I felt like Maria straight out of Sound of Music…ha! 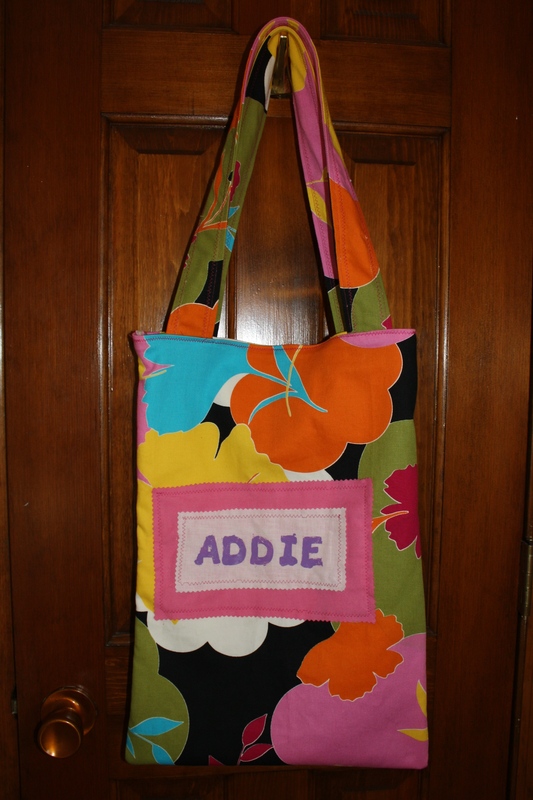 Once I was on the repurposing kick, I found an old sling I used with my youngest and decided to make a school bag for her because she will be starting preschool in the fall. I definitely believe I have found a new love, and it is my Brother sewing machine. This entry was posted in DIY and tagged DIY, eco friendly, holistic, home, homemaker, homemaking, make, making, mama, mindfulness, mom, pattern, repurpose, repurposing, sew, sewing, sustainable, sustainable living, thrift, thrift store. Bookmark the permalink. Awesome Job on the sewing crafts!! I, like you am not a big sewing person with patterns. They freak me out!! And you have to be so gentle with them. My sewing schools were learned in Home Economics class in middle school. Usually I am so excited to finish the project and see what it looks like that I hurry to much and make mistakes. Kind of makes you proud to see someone wearing something that you have sewn. Bet Gianna and Addie look adorable in them!